What better than a guided walk to find out about a city? Aix-en-Provence will reveal its elegant mansion houses, beautiful architecture and monuments, all reminders of its prestigious past. 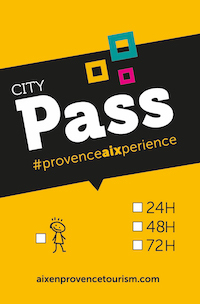 All guided tours depart from the Aix-en-Provence Tourist Office. Each tour’s commentary is the intellectual property of the guide. Recordings during the visits are not allowed. Note taking is done in agreement with the guide. Want more information on tours?